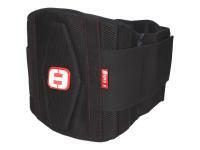 High quality kidney belt from German accessories manufacturer Speeds. The Professional range is cut higher in the back and reinforced several times, in addition to this it has a 2-fold adjustment range by velcro. The additional, breathable mesh material also reduces perspiration to warmer days. Both Speeds Kidney Belts Basic and Professional offer both functionality however the Professional stands out for higher quality materials and better comfort from basic model.